Enjoy Daily Treat Of 20 MB Free Internet Data In Telenor/UninorWow Box App Is Providing Daily Treat Of 20 MB Free Internet Data In Telenor/Uninor. Hurry !!! Grab This Offer Soon !!! Now Here You claim Button Just claim it. Hurray !! You Received 20 Mb data Instant in your telenor Number for one day. Repeat This process daily To get 20 Mb data daily. WowBox is a lifestyle app that brings a new way to experience the internet. 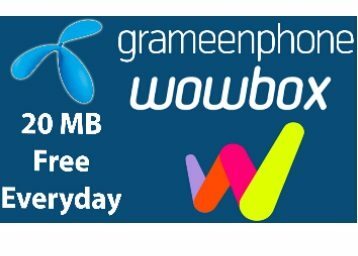 It’s made exclusively for Telenor and GrameenPhone customers and is completely free to use; no data charges incur by browsing and loading content in WowBox. WowBox gives you free access to a full range of great content – everyday and in your local language. Get up to date, be entertained, have fun with daily news updates, lifestyle tips, games, sports, horoscopes, jokes and competitions. Get the greatest deals on the data bundles and other local products. Last but not least, get tokens and use them for the next purchase.